The season to celebrate escalates in the fall. Visit the Gulf Coast in October, and you’ll encounter a carnival, concert, fair or jubilee at every turn. Nonstop festivity, crisp blue skies and perfect temperatures make October the ideal month at the beach. Locals also have a deeply ingrained passion for food, especially seafood. So it’s only natural they would dedicate a four-day festival to the wild Gulf Coast shrimp. Yes, these delectable warm-water crustaceans are nationally recognized for their sweet taste and firm texture. Usually boiled or fried, they’re a dietary staple in these parts. 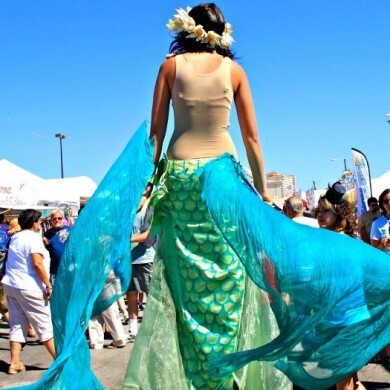 Not surprisingly, the biggest community event in Orange Beach and Gulf Shores, Alabama is the Annual National Shrimp Festival, with the emerald waters of the Gulf of Mexico as its stunning backdrop. The popular regional celebration was recently named No. 7 in the Southeast by Southern Living magazine as “Best Festival,” and was deemed one of the Top 5 tourist attractions in the State of Alabama. The festival now hosts close to 300 vendors. Between the arts & crafts, children’s activity village, fine arts, food and retail marketplace, there’s something for everyone. These fine folks exhibit everything from pottery, sculpture and jewelry to watercolor paintings and more. It’s the perfect opportunity to kick off your holiday shopping with some truly unique finds. All of this, plus a sand-sculpting competition, 10K/5K run and the exciting “Best of the Fest” restaurant challenge. The highlight, of course, will always be the food boardwalk, where you can feast on a vast variety of local seafood prepared every way imaginable. Two hundred pounds of shrimp are cooked each day by some of the area’s best chefs. Plan to sample their award-winning recipes at tasting times posted outside the sponsor tent. Did we mention you can hear four days of continuous live music on two stages? Feast your ears on musical acts to suit all tastes, including Blues, Motown, Southern Rock, Jazz, Zydeco and Country. Today’s Chairman, Matt Mogan, grew up in up in the area and has been on the committee since 2001. He previously ran the food boardwalk, and reports there are even more exciting changes in 2014, when the festival will be held October 9-12. Mogan, who enjoys everything about the festival but says being on the beach makes it extra special, tells us the festival takes most of the year to plan. More than 600 volunteers work year-round to organize the amazing event, which organizers expect to be attended by a crowd of at least 300,000. The beachfront location for the Annual National Shrimp Festival is directly in front of The Hangout at the end of Highway 59 in Gulf Shores. It is held every year on the second weekend of October. For more information, please visit the Annual National Shrimp Festival website.